Family fun—with flame throwing pets! Even with Shrek and its offspring, Madagascar, Monsters vs. Aliens and Kung Fu Panda in its arsenal, Dreamworks may have topped itself with How To Train Your Dragon, an exciting, fun and sensationally entertaining movie for everyone, a thrilling action adventure fantasy that should slay the competition and grab great word of mouth. The mythical story about a Viking teen that rebels against his people’s dragon slaying tradition and befriends one of the fire breathers takes 3D animation to new heights and should keep audiences of all ages enthralled. Strong box office followed by blockbuster DVD action is assured. Its only drawback will be the glut of films vying for those 3D screens, but otherwise it should be smooth sailing for this triumphant ‘toon. Based on Cressida Cowell’s best selling book for kids, How To Train Your Dragon may be taking a page from the E.T. formula, but with its mix of Viking mythology, action, comedy and heart it feels like no other CG 3D animation effort, at least in recent times. Story revolves around Hiccup (Jay Baruchel), an awkward, teenaged Viking who has a hard time finding his place in the family business, as it were. The macho dragon slayers that include his father and Viking leader, Stoick the Vast (Gerard Butler), are not exactly a crowd he fits in with easily, although to keep dad happy he tries. Typically P.C, the ‘toon also offers up Astrid (America Ferrera), the de rigueur young female counterpart who is strong and aggressive in every way Hiccup isn’t. His training exercises with other budding teen dragon slayers start to give him a sense of self-worth but his whole world is turned around when he befriends an injured dragon and then must hide the fact from everyone, including his feared father. As the relationship with the endearing creature grows so does the peril that has engulfed Hiccup and his new friend. Spectacular action set pieces and a beautifully rendered sense of time and place highlight this thoroughly engaging tale truly well-enhanced by stunning use of 3D technology. Flying scenes are in many ways as awesome and inspired as Avatar. Directors and co-writers Chris Sanders and Dean DeBlois and their crack team of animators create eye-popping visuals without ever losing track of the compelling tale they are telling. Voice work is exemplary with Butler’s proud but stubborn Viking leader and father a standout. 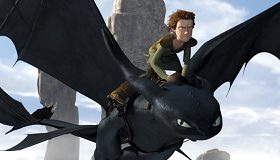 Baruchel is appealingly cocky and youthful as Hiccup, while Ferrera’s Astrid is aces all the way. Jonah Hill provides comic relief as Snoutlout. Talk show host Craig Ferguson and SNL’s Kristen Wiig also score points in briefer roles. With Shrek 4 in the wings for Memorial Day, Dreamworks Animation should be sitting pretty with a one-two ‘toon punch. If marketing is careful not to position Dragon as simply a kiddie film it could pave the way for a very successful run on 3D screens and beyond.